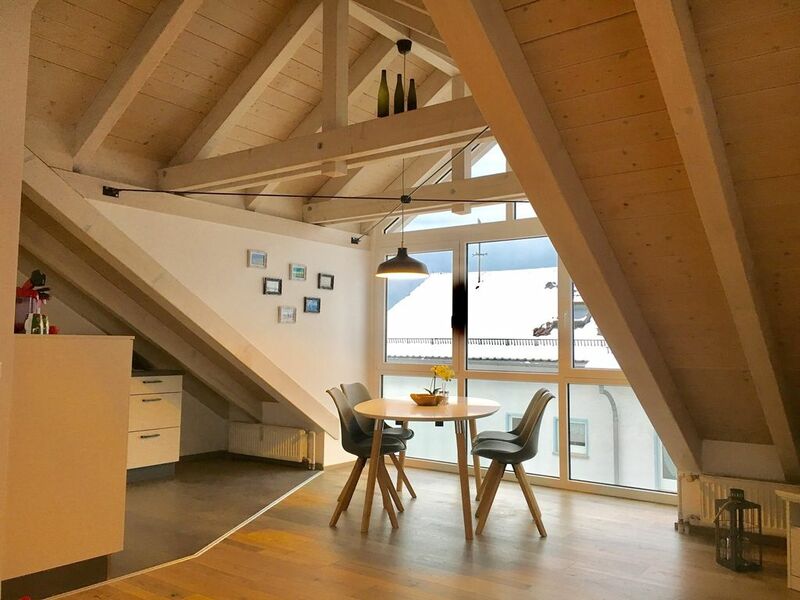 Welcome to the apartment "Mariabrunn"
The bright and modern furnished 2-room attic apartment with 55m2 is located in Mariabrunn, a district of Eriskirch with about 1. 600 inhabitants. The apartment is located only 3 km from Lake Constance between Friedrichshafen and Langenargen. The Lake Constance, beach baths, as well as many excursion destinations around Lake Constance are to be reached shortly. Shops, restaurants, doctor and pharmacy are in the surrounding area. The apartment was newly renovated and modernized with attention to detail in 2016/2017. The apartment has a large living and dining area with an open fully equipped kitchen. Dishwasher, fridge-freezer, oven and stove with ceramic hob, coffee machine, microwave, water cooker, toaster are available. The high ceilings and visible wooden beams as well as the large window front lend the apartment the certain charm. The sleeping sofa with integrated spring mattress offers the possibility for 2 more sleeping possibilities. A baby's cot and baby high chair are also available on request. The bedroom is equipped with a double bed (1,80 x 2,00m), a sleeping chair (0,80x1,90m) and a large wardrobe. The bathroom has a bath with shower. Bed linen and towels are provided. A TV with cable connection, Blu-ray player and Internet with WLAN is available for free. Ironing board and iron are also provided. The car parking space is directly in front of the house. On request we can pick you up from the airport / train station. The apartment is suitable for long term tenants, couples and families. The apartment is not wheelchair accessible. Smoking in the apartment is not allowed. Es ist eine sehr schöne Wohnung. In wenigen Minuten ist man mit dem Auto am See. Der Vermieter ist sehr nett und alles lief unkompliziert ab. Wir hatten tolle Tage die Nähe zum See und anderen Orten an denen wir Aktivitäten gemacht haben war super. Die Wohnung ist super gut ausgestattet. Einzig als Dachwohnung muss man sich mit evtl. hoher Temperatur anfreunden. Aber wenn man weiß wie geht das. Wlan und Tv gibt es auch! Preise können sich bis zu einer verbindlichen Buchung ändern.